Chandra Karuna Yoga – Breathe. Believe. Receive. “Chandra” means “moon” and “Karuna” means “compassion”. As the moon, we are invited to do our work with mastery, to come out from the clouds and shine! Compassion, to remind ourselves to keep our hearts soft and open to Love. Chandra Karuna Yoga believes yoga is for everyONE. Yoga helps us to find more awareness and acceptance in our bodies and minds, and compassion and gratitude in our hearts. It allows us to come back to our True Self and to feel accepted and good enough as we are. Daniela is the founder of Chandra Karuna Yoga studio. She teaches an approachable Hatha Vinyasa and Yin Yoga, with an emphasis on finding balance and ease in movement. Daniela has been practicing yoga since 2010, and teaching since 2016. She is a certified 200 hour yoga teacher with Hari-Om Yoga School, and also a certified yin yoga teacher (100 hours) with the 5 Elements International School of Yoga, led by Vinay Jesta, and with Sarah Lo, fellow teacher of Sarah Powers. Her classes bring awareness into the body, and are directed to reach that perfect balance between strength and ease, yin and yang, our feminine and masculine sides. Daniela’s approach to yoga combines a focus on alignment and strength, with a feeling of surrender and ease. She welcomes everyone to the mat, so they may come back to their True Self and live the light of yoga into their daily lives. Daniela includes in all her classes the concepts of conscious breathing (Pranayama), Mindfulness Meditation and Sound Healing. She is currently based in Puerto Viejo de Talamanca, on the Caribbean Coast of Costa Rica, where she teaches daily yoga classes at Vista Verde Guesthouse; and she also spend a lot of time in Europe, where she organizes various yoga retreats and events. 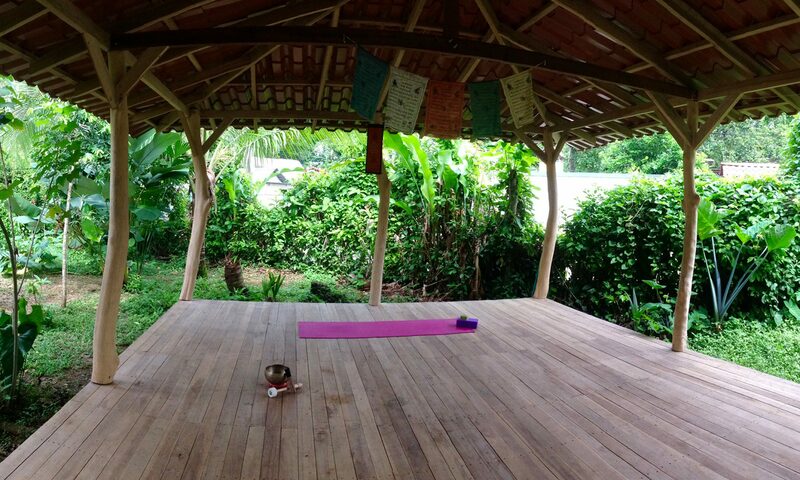 Yoga retreats can be truly transformative experiences, and everyone who enjoys a lifestyle of health and wellness can really benefit from them. Being on a retreat allows you to deeply listen to your body, rest when you need it, and be free from stress. Listed below are the upcoming retreats and events in Costa Rica and Europe. Combining jungle, sun, sea, and nature, will bring balance and harmony to your body, mind, and soul, allowing you to re-connect with your true Self. During your time at Vista Verde, you’ll enjoy 2 daily yoga & meditation classes, and a delicious home-cooked healthy breakfast per day. This is the perfect opportunity to relax and recharge, while enjoying the stunning beaches of Costa Rica and its incredible wildlife. Before you arrange your travel, please consider that Puerto Viejo is approximately 5 hours by bus from the main airport San Juan Santamaria (SJO) in San José. From San José you can take the public bus (Mepe) which will cost you approximately 10$; alternatively we can arrange a private shuttle transportation from the airport, which costs $50 one-way. Best yoga teacher I had while traveling Central America: I was able to learn so much from her during my lessons in Puerto Viejo! Please get in contact if you have any questions about the upcoming events or yoga classes.